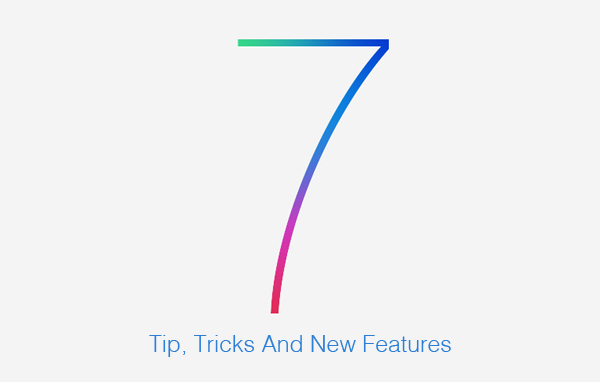 As posted on earlier article here where iOS 7 in action, I’ve found nice article reveal 15 of the best iOS 7 tricks that you may’ve need. When Apple released iOS 7 to the public earlier this month, it was met with a lot of criticism. Many people believed the changes in iOS 7 were not as innovative as features like FaceTime and Siri. A lot of improvements have been made in iOS 7 from previous iOS versions though. Some changes are apparent, but many of the best features are hidden. Apple made many changes in the Notification Center. You can find the Notification Center when swiping from the top. The notifications are now grouped into “Today,” “Tomorrow,” and “Missed.” You can toggle these options under Settings -> General -> Notification Center. 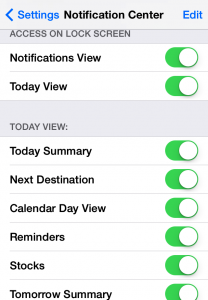 Under these settings you can control items like Today Summary, Next Destination, Reminders, Stocks, and Tomorrow Summary from the Notification Center Settings console. 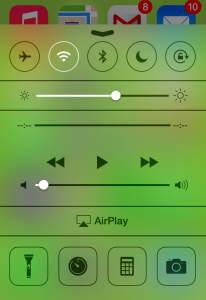 One of the new features built into iOS 7 is called the Control Center. The Control Center lets you quickly adjust the volume, Bluetooth, brightness, Airplane Mode, and portrait orientation. There are also icons to quickly pull up apps like Flashlight, Camera, Calculator and Clock. You can quickly access Control Center by swiping your finger from the bottom to the center. In the older versions of iOS, you could find the Spotlight Search feature by swiping all the way to the left. 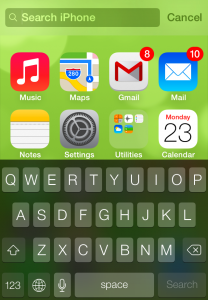 Search is no longer all the way to the left in iOS 7, but there is still a quick way to access search. Simply swipe your finger from the center of the screen to the bottom to pull up the Spotlight search bar at the top of the screen. 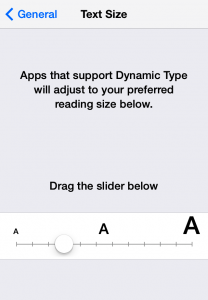 One of the best features added to iOS 7 is the ability to adjust text sizes and properties. You can find the text size properties under Settings -> General -> Text Size. You can also make the text bolder by adjusting the settings under Settings -> General -> Accessibility. The App Store now has the ability to have apps automatically updated. You can set this up by going to Settings -> iTunes & App Store. Scroll towards the bottom until you see “Automatic Downloads.” Toggle the “Updates” switch so that it is on. By default, app updates require WiFi. 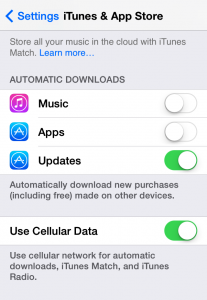 You can set it to “Use Cellular Data” if you are not concerned about data usage caps. There is a new feature within the App Store called “Wish List.” You can add paid apps to the “Wish List” as a future reference for apps that you want to buy later. This feature can be used in the context of apps to buy your kids if they get a good grade in math class as a reward. 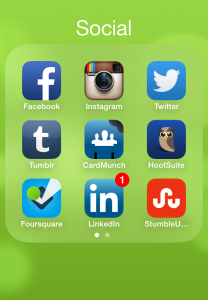 Some people may use this feature as a list of apps to buy when getting their next paycheck. You can access this feature by opening the App Store and searching for a specific app. Once the app is open, tap on the icon with the three lines at the top right. 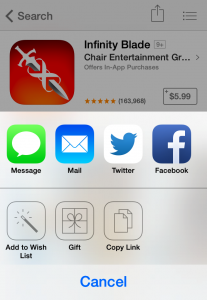 Tap on the “Add To Wish List” icon from there. 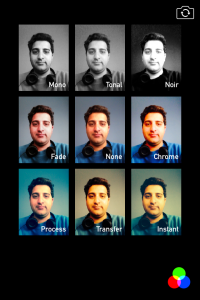 iOS 7 has built-in live photo filters so you no longer need to use Instagram to make your photos look creative. You can access this feature by opening the Camera app and tapping on the icon with three circles overlapping each other. Most other photo filter apps requires you to take a photo first and then import them so a filter can be applied. Seeing photo filters applied in real-time can be a major time-saver for photographers. 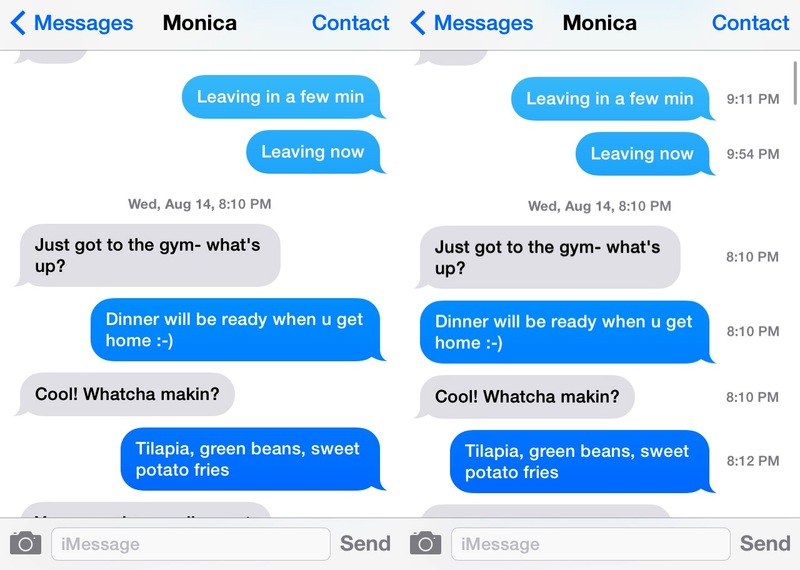 One of the most irritating issues in previous iOS versions was the lack of timestamps for every text message, iMessage, and SMS. In many cases, I would not know if a message was sent to me at 8:10PM or 8:15PM. Messages were lumped together under one timestamp. Now Apple lets you see individual timestamps by opening your messages and sliding your finger from right to left in a dragging motion. One of the features that I am most excited about is the ability to block someone from calling, messaging, or trying to FaceTime with you. Sometimes telemarketers that I have hung up on keep calling back. Now I can easily block them after saving the number as a contact. If there is someone that keeps harassing you like a telemarketer or an ex-boyfriend, then you can simply block them. This feature can be accessed from Settings -> Phone -> Blocked. In the previous version of iOS, each folder was limited to only 12 apps. The new version of iOS lets you add a lot more apps. This is supported through the use of multiple pages in each folder. You can drag apps into folders by pushing down on an app icon until it starts wiggling. Drag the app on top of another app or into a folder from there. When adding a 10th app into a folder, the folder will create an additional page. 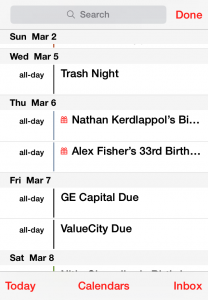 One of the features that appears to be missing on first glance in the iOS 7 calendar is the list view. It is actually there, but is hidden from plain sight. The list view feature is now tucked within the Calendar’s search function. You can find the List view when opening the Calendar app and tapping on the magnifying glass icon at the top right. Ever since Apple announced Siri’s voice in the iPhone 4S model, it has always been a female voice. If you want to mix it up and change Siri’s voice and language, this can be adjusted under Settings -> General -> Siri. Siri’s language can be changed from English to Cantonese, Mandarin, French, German, Italian, Japanese, Korean, and Spanish. 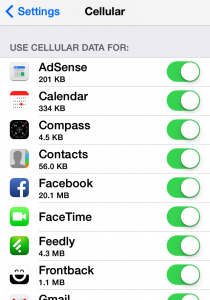 Some apps can be bigger cellular data usage hogs than others. For example, your Netflix app likely consumes more data than the Pandora app. There is a new feature in iOS 7 that lets you figure out what apps consume the most cellular data and then you can restrict them to WiFi only. This feature can be accessed by tapping on Settings -> Cellular and scrolling towards the bottom. A major reason why your battery gets drained throughout the day is because some apps collect data in the background. 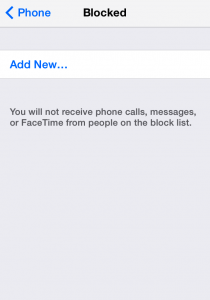 Now you can block apps from running in the background using iOS 7. 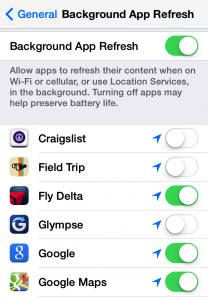 To access this feature go to Settings -> General -> Background App Refresh. You can disable every app running in the background with one toggle switch or disable specific apps individually. The search feature in the Mail app in previous versions of iOS had major issues. Sometimes when searching for an e-mail in previous iOS versions, it would say “Continue search on server,” only to give up without any results. Now the search feature in the Mail app actually works! 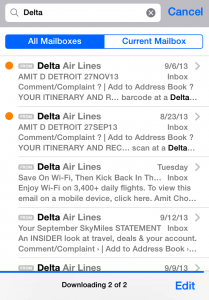 For example, I did a search for “Delta” in my inbox and it actually found all of the results ranging from the most recent e-mail back all the way back to 2005 when I first started getting e-mails from the airline. Are there any iOS 7 features that you enjoy that was not mentioned in the list? Please let us know in the comments!